It's been an exciting past few weeks here at PRES. With the most beautiful weather sun shining over our shop on Prestwich high street and the arrival of our new head Chef, Amelia, our brand new menu was crafted. 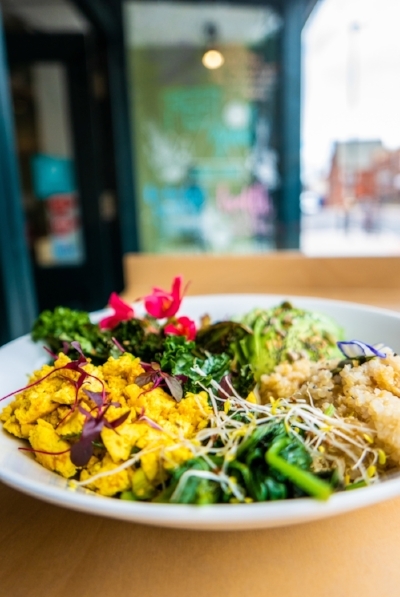 Amelia brings an array of healthy flavours, nutritious ingredients, vegan, vegetarian, gluten free and other dietary requirement options to our little juice bar on Bury New Road. Since we launched on Wednesday we've heard nothing but a positive response. We're so excited to share with you a brand new breakfast, brunch, sandwiches, wraps, bowls and smoothie bowls! Here are just a few of the new additions.